Juliette Morgan Angelle is the daughter of Morgan and Adrienne Angelle. 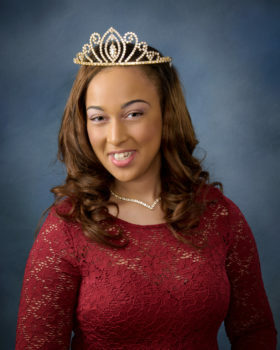 Born in Lafayette, she has attended Woodvale Elementary, Edgar Martin Middle and is currently a Senior at Acadiana High School. Her supporting family members include her brother, Jaden, along with step-sisters Laquesha, Shatira and Magan. Juliette’s athletic activities have been bowling, basketball and cheerleading, but her main interests are singing and music. Her favorite genres are Pop and Gospel. Her favorite artists are Bruno Mars and Tamela Mann. She is quite the movie buff, with Frozen being at the top of her list. Juliette is a member of Our Lady Queen of Peace Catholic Church. She looks forward to continuing her education and entering the field of Teaching.